Sir Winston Churchill said, “Kites rise highest against the wind, not with it.” After reading Roger Ebert’s incredible autobiography, “Life Itself: A Memoir,” this quote appears fitting. Most of his significant life achievements were accomplished well before his serious bout with cancer that has left him without a jaw and unable to speak, eat or drink normally since 2006. However, what strikes a cord with me is his tremendous positive attitude since his cancer and his voraciousness toward social media as in Facebook, Twitter, his award winning RogerEbert.com blog and my favorite, The Ebert Club Newsletter. He started his journalism career at the Chicago Sun-Times in 1967 and by age 33 received the Pulitzer Prize for film criticism. He’s also an acclaimed author of many books and co-hosted the popular award winning TV show, “Siskel and Ebert.” He turned to social media after his health issues and credits these types of media for helping him connect with the world. His blog alone had over 111 million views this past 12 months. 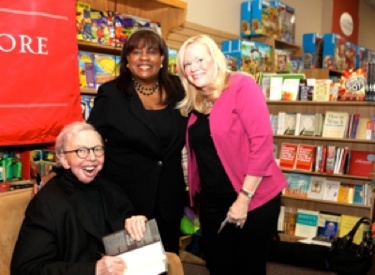 Anderson’s Bookshop hosted a book signing for Ebert’s autobiography, “Life Itself:A Memoir” on October 6, 2011 at their Naperville location. The store was packed as fans were anxious to meet the man behind the writing. Chaz Ebert, his wife of 19 years, was by Roger’s side that evening, chatting with people and keeping the book signing line progressing. I decided to ask Ebert if he would be open to answering questions for an interview after I had read the book. As luck was on my side that night, he agreed. Now my dilemma was about to begin – what do you ask a person that you’ve admired for so many years? Whew − I was terrified to put it mildly. Nonetheless, my questions were finally written and all answered via email. Now, I’m hoping you’ll gain, as I have, some insight into this extraordinary man. First and foremost, the book is poignant, fascinating, heartfelt, inspirational and informative. He talks about so many facets of his life, as if you’re sitting down and having a cup of coffee with him. I particularly enjoyed the mentioning of some of the books he’s read and what he’s learned from them. The book also includes chapters on his encounters with famous people, his struggles with alcohol, world travels, his marriage to Chaz, the details of his illness and his views on life. I started the interview by inquiring about his childhood movie going experiences at the Princess Theater in Urbana, Illinois. They were filled with nostalgia and a fondness of the experience, and I wondered if this might be the reason he developed a love for movies. The University of Illinois college section of the book is captivating as he writes about not only the professors and classes, but also includes so many other aspects of that time. I wondered about his Midwest college experience and if he ever thought about how it would have been attending a college on the East or West coast. “The University of Illinois was in my home town, and felt like the next logical step after grade school and high school. It is only now, knowing a little more about the world, that I realize what good teachers I had, and how the University was the stage for my coming of age. I liked its enormous size because you didn’t get typecast; you could enter as one person and emerge as another,” stated Ebert. Ebert’s book touches on the many celebrity interviews he conducted and I wondered about this, as being a full time film critic and adding interviews on top of that creates a heavy work load. He told me that he enjoyed the interviews and that the people were truly stars to him. What aspect did he like best about the interview process? In his book, Ebert explains that he’s very happy and living a wonderful life despite his battles with cancer. Also, I’d like to add that he’s not critically ill, as was somewhat implied in the Esquire article that appeared in 2010. He’s cancer free and all of his numbers are good − if you know what I mean. Speaking of Chaz, he talks about a photograph in his book of their wedding. The photo is of Gene and Marlene Siskel and their two girls alongside Roger and Chaz. It’s a beautiful photo and truly displays a feeling of friendship between all. I asked about the comparison of a visual, say a photo or film, to the written word. “You can write whatever you want about a photo, but the photo always gets the last word,” said Ebert. When asked about note taking during a film he said that sometimes he does, just little things that he wants to remember. He also said that he can’t read a lot of them. The last comment demonstrates his humor, which is pleasantly scattered throughout the book. We can learn so much from others and Roger Ebert is one of those people who is making a difference. Some say through his expanded writing he’s regained his voice. I say it’s never left him; he’s just turned up the volume.